Remove the instrument side finisher LH (1) using a suitable tool. Remove the hood and fuel filler handle assembly from the instrument lower panel LH. 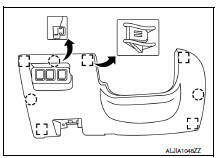 Refer to DLK-191, "FUEL FILLER OPENER CABLE : Removal and Installation". Release the instrument lower panel LH clips and pawls using a suitable tool. Disconnect the harness connectors from the instrument lower panel LH and remove.